Another change that you will note next to the ever present USB connector are two MCX female connectors allowing for a reference clock input and output. The reference clock must have a 0V DC bias available since the system monitors the DC bias to detect the reference clock. The reference clock output of one RSP2 and be connected to the reference clock input on another RSP2 therefore keeping both radios in synch. This allows several RSP2 to be daisy chained to the reference clock. Those who are experimenting with multi-channel coherent receivers should find the reference clock daisy chaining feature to be of great interest. Here is another nice feature for users who may experience interference or images being generated by strong signals. 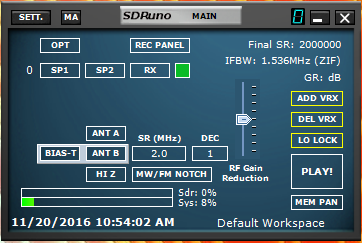 The MW / FM notch filter can be activated through SDRuno’s control panel. The MW/ FM filters covers both the medium wave broadcast band (525 kHz -1710 kHz) and VHF FM band (80 MHz – 110 MHz) simultaneously. The RSP2 improves front end filtering by adding 10 high selectivity front end filters. This improves over the current 8 preselection filters that are available in the RSP1. The RSP2 now adds a software adjustable low noise preamp which will allow the RSP2 user to further tweak the RSP2 receiver to better match the signal environment. Currently the RSP1 low noise preamp can only be set to on or off. The trimmable TXCO will be accessed through SDRuno in future releases. Currently with the latest release of SDRuno, the TXCO can be calibrated using a 1 click method when the RSP2 is tuned to an accurate signal source such as WWV. Right now the calibration data is not stored RSP2 itself. The SDRPlay Team is working on a method to store the calibration in the RSP2 so the data is retained if the RSP2 is moved to a new computer. The good news for those who are familiar with the RSP1 and SDRuno is that not much has changed as far operating the RSP2. There are a few more settings available for the RSP2, but basic operation is pretty much the same. Install the software, plugin the RSP2 to your computers USB port and you are ready to go. You can even keep your RSP1 plugged in and SDRuno will ask which one you want to use when SDRuno starts up. Also you can make a copy of the SDRuno software to into another directory and run both the RSP1 and RSP2 simultaneously using the two separate instances of SDRuno. When you start SDRuno you notice that there are some different settings available in the control panel that you would not normally see with the RSP1. When connected to the RSP2, there are new buttons in the control panel to select ANT A, ANT B, Hi Z, Bias T, and MW / FM Notch. The slider now lets you adjust the RF Gain instead of the IF Gain. There is no LNA button. You still set the sampling rate and decimation the same way. The RX, SP1, and SP2 panels and settings remain unchanged. Under the Main Settings / Input section, there is a new setting to allow you turn off the IF AGC. There is also a new setting under the CAL menu to turn on the Reference Clock Output. However, the SDRPlay Team will be tweaking the SDRuno software in the future to take full advantage of the RSP2 new capabilities and features. So, how does the RSP2 compare to the RSP1? After many hours of simultaneously testing the two receivers against one another using the same antenna via a splitter. However, please keep in mind that the testing was done with a early version of SDRuno that was modified to support the RSP2. Knowing the SDRPlay Team, the SDRuno software will probably be further tweaked to further leverage the new features of the RSP2. So, some of this comparison may change. Plus both the RSP1 and RSP2 can be tweaked in several different ways that the comparison results can change greatly. For that reason, the two receivers were tested primarily using SDRuno’s built in defaults for each receiver which may not be the best setting in a given case. At this point, it would be fair to say that the RSP1 and RSP2 are basically very similar in RF performance. This should come as no great surprise since RSP1 and RSP2 are based on the same receiver hardware. However, there were times that the RSP2 appeared to be more sensitive or exhibit a lower noise floor than the RSP1 depending on band and signal conditions. In the end, the two receivers where pretty evenly matched. A little preliminary testing was done with an Outernet L Band Amplifier on the RSP2’s antenna Port B with Bias T turned on. Even though a not so great antenna was used, the results looked very promising. The RSP2 is looking to be a good platform for satellite reception experimentation. After obtaining a proper antenna, this will be looked into a little further. Ok, so why would you want to upgrade to the RSP2. Well, there are plenty reasons. The ability to work with multiple antennas is a huge asset with the RSP2. That one thing alone is well worth the upgrade. Better RF shielding and the MW / FM Notch filters are another motivator for those that may run into more than normal RF interference. The Bias T feature will be very convenient for users experimenting with satellite reception. The Reference Clock in / out feature and the highly stable trimmable TCXO will be valuable for users needing high precision. Improvements to the front end filters and adjustable pre-amp can also be a asset in more critical signal environments. So at the end of the day which RSP should you buy? In a nutshell the RSP1 will be fine for those who really just want a very good SDR receiver for casual listening in the AM, FM, VHF, UHF , and HF bands. The RSP2 will be well suited for those who can use or need the multiple antenna ports and have a need for a higher precision SDR radio. The RSP2 will also be a very good choice for those who need a precise stable receiver for use in the satellite bands. Frankly you can’t go too wrong either way.